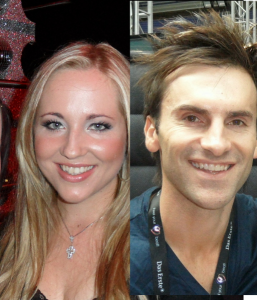 Top South African singers, Jasmyn and David Fourie, were recently in Düsseldorf to experience the 2011 Eurovision Song Contest. The have both covered various Eurovision songs in the Afrikaans language. Here you can see Jasmyn’s performance from Euroclub and also interviews with both her and David. Eurovision songs are very popular in South Africa. They are always in big demand to be covered in the Afrikaans language for albums. Jasmyn has already recorded a limited edition album of Eurovision songs and she performed 2 of them at the Euroclub. First she sang the United Kingdom 1991 entry, A Message To Your Heart. In Afrikaans it is called ‘n Boodskap vir jou hart. Then she performed the Germany 2001 song, Wer liebe lebt. This is called Wie liefde leef in Afrikaans. David Fourie has also covered Eurovision songs on his albums including the Estonia 2002 entry, Runaway. In Afrikaans he called the song, Ek Wil Jou Wys. The big news from David is that he has already recorded this year’s winning song from Azerbaijan, Running Scared. He recorded song with another South African singer, Monique. In Afrikaans it is titled My hart het klaar besluit. You can see EuroVisionary’s interviews with Jasmyn and David and also Jasmyn’s Euroclub performances below. In A Moment Like This becomes South Africa’s biggest selling Eurovision cover!